Frome is a town that is growing on me. It has an energy that is infectious and downright happy and the monthly Frome Independent market reflects all that is brilliant about the town. On the first Sunday of each month the town centre is closed the traffic and a huge artisan village is created, with stalls crammed into every corner offering artisan homewares and jewellery, a farmers market, food stalls with too much choice for my greed and live music at every turn. The party goes on all day and the place is buzzing with chatter, laughter and general goodwill. 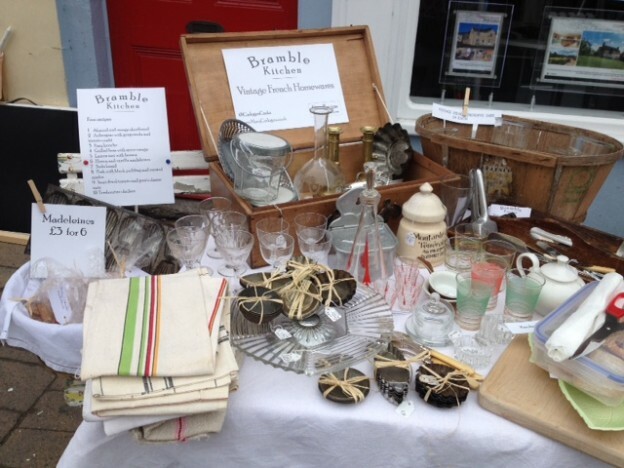 Not wanting to miss out on being part of this vibe we joined in the fun last Sunday to set up our tiny suitcase stall selling vintage French homewares collected over our ten years in France. Of course not content to leave it at that I baked over a hundred madeleines to reflect the theme, plus every buyer was sent on their way with one of my recipes- the soda bread, tomato and goats cheese tartlets and almond and orange shortbread were particular favourites with the crowd. 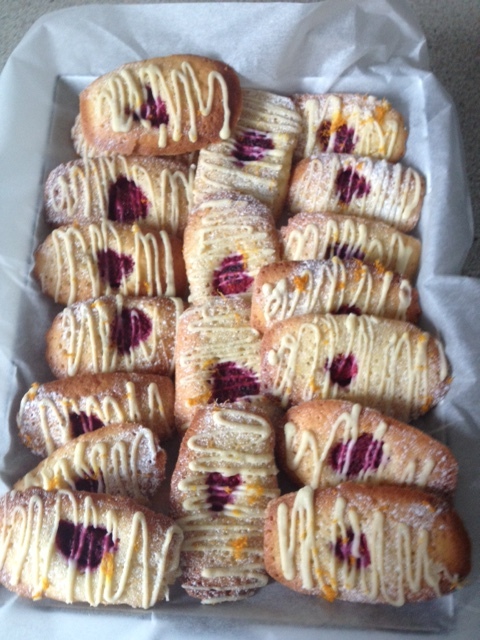 If you are in the mood for a bit of light baking have a go at these Raspberry and white chocolate madeleines. They are very good on their own with a cup of tea or on the side with creamy desserts such as lemon posset or crème brulee. Oh and if you feel like a bit of batch baking they freeze really well. 1 Heat the oven to 190C/fan 170C/Gas 5. Butter 15 madeleine moulds(or use tartlet tins if you don’t have the moulds) and dust lightly with flour. 2 Mix the flour and sugar in a bowl. Put the butter, egg yolk, honey and orange zest into a separate bowl and whisk with a fork to mix. Whisk the two egg whites until stiff. Fold the butter mixture into the dry ingredients until evenly mixed, then fold in the egg whites in two batches using the whisk blades. 3 Divide between the prepared moulds and bake press a raspberry intot he centre of each.Bake for 12-15 mins until golden brown and firm to the touch. Leave to cool in the tins for a couple of minutes, then turn out and cool on a wire rack. 4 Melt the chocolate in the microwave or in a bowl over hot water. Leave to cool for a few minutes until thickened, then drizzle over the madeleines. Leave to set. 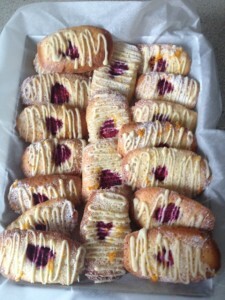 This entry was posted in Baking, bramble kitchen and tagged artisan, baking, farmers market, madeleines, market, vintage. on 7th July 2015 by marycadogan.